A little less than 2 weeks ago we found out that due to budget shortfalls, the Indianapolis- Marion County Library Board of Trustees may have to close 6 library branches in the Indianapolis area. One of the branches on the chopping block is Spades Park Library. This little library is my neighborhood library and sits only a few houses down and across the street from me. I can see it from my front porch and I go there on a very regular basis. 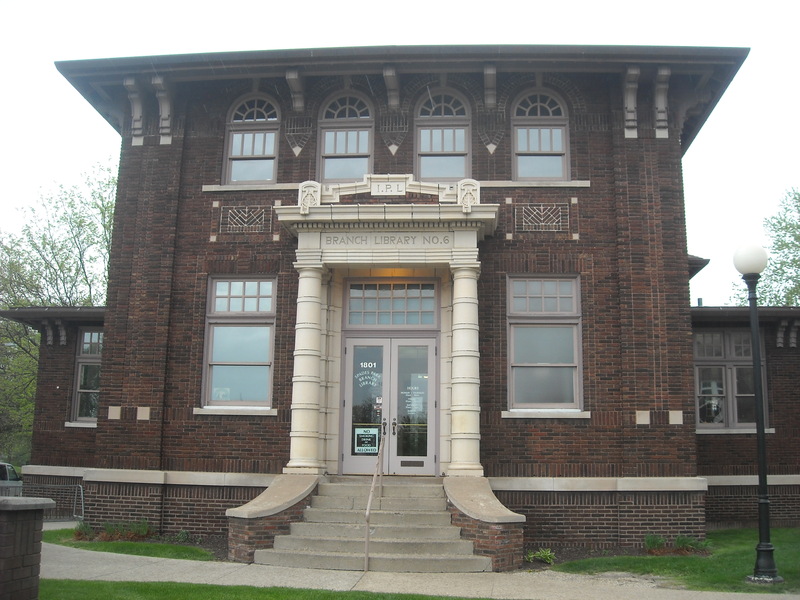 Spades Park Library was gifted to the City of Indianapolis by Andrew Carnegie and has been a community gathering place, safe haven, and resource to the community ever since. Now it might be closed after 98 years of service. This news is heart-breaking to me and the large majority of my neighborhood. We attended in full force a meeting of the IMCPL board of Trustees last Wednesday to voice our concerns and had record-breaking attendance at our neighborhood association meeting (yes, at the library!) last Wednesday. After the meeting, I decided I had to do something, and fast. Thanks to the quick work of Cheryl Andrey, I was able to get a tee shirt design in my hands by late Sunday evening. Last night, my husband and I spent the night crouching over the YuDu pulling shirt after shirt as the orders began to pour in. 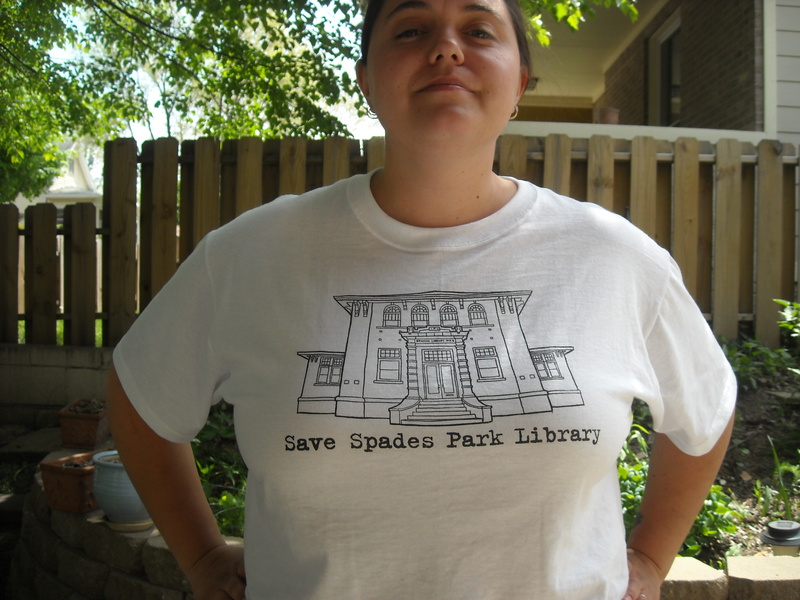 I’m so proud of my neighbors and their willingness to give money to save the library in our neighborhood (all proceeds from the shirt sales are going to Spades Park Library). 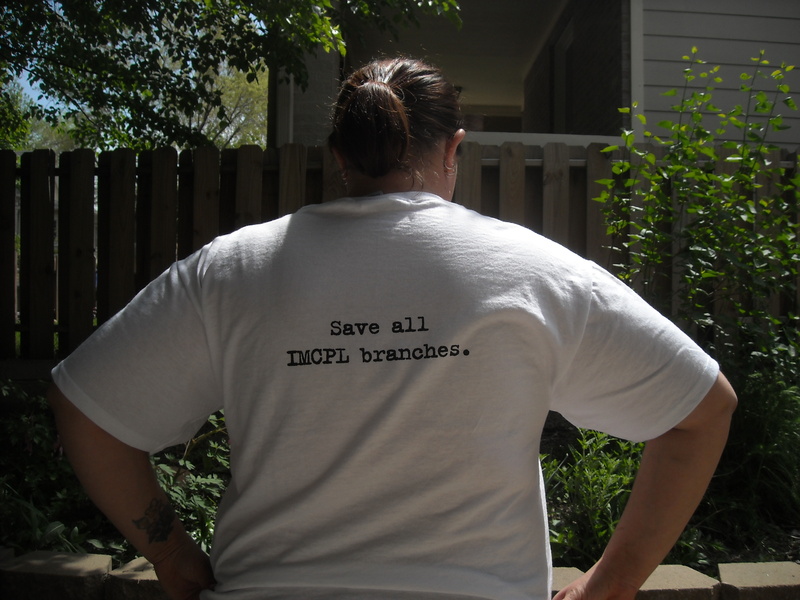 Plus, I feel good that I was quickly able to put shirts on the backs of over 25 people before we attend another meeting to fight for our library later today. It’s hard sometimes to keep up on blogging, tweeting, Facebook-ing, all creating my own jewelry to sell at fairs and on Etsy, but I know you’ll understand if I’m less than active on the blog over the next couple of weeks. I’ve taken on a serious role in this, and I’m trying my hardest to fight this library fight and save our community center. Even if you don’t live near Spades Park Library (or in Indianapolis for that matter!) You can still support our cause and get a shirt for yourself. If you paypal $18 plus $3 shipping to mellenlatta@gmail.com, I’ll send you a shirt, and you can feel good knowing you are helping to keep open a small, historic and very valued community resource.